Milo, who was adopted from China as a baby, lives with his parents in a smugglers inn called Greenglass House. During his Christmas vacation, he and his family expect the inn to be vacant, so they are shocked when, one after another, guests keep arriving. Amidst the crowd, Milo links up with the cook's daughter, Meddy, who teaches him to play a roleplaying game that allows them to spy on the suspicious behavior of the guests, all of whom have ulterior motives. Many elements contribute to the overall strength of this book. Chief among these is the setting. 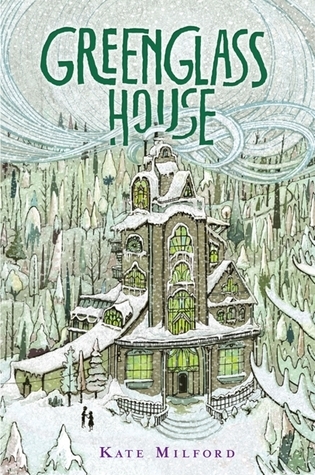 Greenglass House is an old, intriguing place with its own history, secrets, and possible ghosts. It is described with such detail that the reader begins to wish she could be snowed in along with the characters. Also wonderfully interwoven into the plot are a series of folktales and stories, some of which Milo reads in a book, and others of which are told by guests of the inn. Each of these stories could be excerpted to stand alone, as most are presented in their entirety, but they also deepen the larger story by revealing characters' motivations, secrets, and connections to one another. The author takes a real risk with this book by purposely failing to mention a key truth about one character until very late in the story. Though the reveal is a big surprise, it also makes a lot of sense and becomes very obvious once the truth is known. Depending on how much the reader likes genre-jumping surprises, this could be received with mixed reactions, but it does seem to work well within the context of the story and makes the climax of the book that much more exciting. Most mystery readers are accustomed to last-minute surprises anyway, so they will probably enjoy discovering a twist. Greenglass House is a lovely contemporary read-alike for The Westing Game, but it is also very much its own creation, with unique characters and a distinct style. In the sea of largely mundane middle grade titles published in 2014, this one is a surprising gem worthy of much praise. (Indeed it has been placed on the long list for the National Book Award for Young People's Literature.) Recommended for mystery lovers and game lovers ages 9 to 14, particularly as a read-aloud. In an orphanage in a French village live the orphelines, a cheerful group of little girls who prefer to live with each other and their caretakers Madame Flattot and Genevieve than to be adopted by families. Brigitte, the happiest of all the orphelines is the one for whom the book is named, as most of the story occurs in her point of view. One day, while out on a group trip, Brigitte becomes separated from the rest of the orphelines and finds herself in the company of a self-proclaimed queen. Brigitte just wants to go home, but the woman, who insists that her husband will one day assume the French throne, wants to adopt Brigitte and employ her as a servant. This delightful book is a true gem. It introduces readers to two settings that are not often represented in American juvenile fiction - an orphanage and France - and it portrays a surprisingly sunny view of life as an orphan. 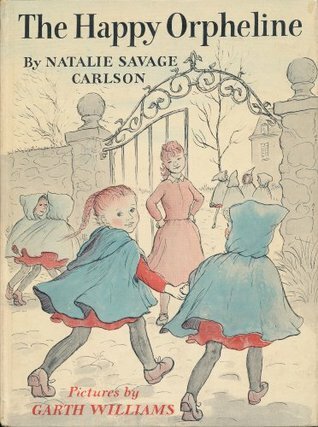 The large group of girls living together calls to mind the Madeline series (though Madeline is not an orphan), and I think this book would be a perfect first chapter book for girls who have loved Madeline during their preschool years. (The cover image shown here- which is not the cover on my edition - suggests the same thing!) The tone and quality of this book also shares much in common with short novels by Johanna Hurwitz, Beverly Cleary, Carolyn Haywood, and Maud Hart Lovelace, and the story feels timeless rather than outdated. 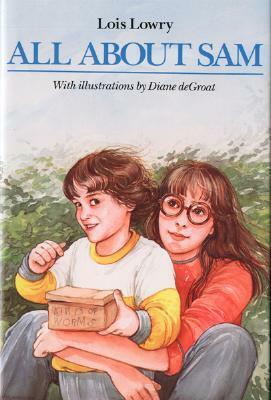 Also noteworthy are the illustrations, which are done by Garth Williams of Charlotte's Web and Little House fame. His drawings give faces to the characters which perfectly match their personalities and they also provide much of the details of the streets of Paris that provide the backdrop for Brigitte's adventure. Among the best images in the book is the scene on page 63 where Brigitte rides on the back of the Queen's bicycle, her braid and limbs scattered every which way as she hangs on for dear life, while the old woman's face remains serene and slightly unbalanced-looking. This illustration almost tells a story unto itself. Girls with adventurous spirits will be pleased to follow Brigitte in her struggle to return home, and they will wish hard for a happy ending for her. Because of its almost exclusively female cast, this book would also make a possible good choice for a mother/daughter book club. There are a total of five books about the orphelines, but I only own three of them right now. Coming soon are my reviews of A Brother for the Orphelines and The Orphelines in the Enchanted Castle. In Betsy in Spite of Herself, sophomore Betsy Ray undergoes a bit of an identity crisis. Desiring to reinvent herself, she goes to Milwaukee to visit Tib for Christmas and returns home with a new set of rules for her personal behavior. She will spell her name "Betsye," stop smiling so frequently, and begin spending time with unlikely and unsuitable suitors. Unfortunately, Betsy's new attitude drives away most of "The Crowd," invites warnings from Julia about being "spoony" and interferes with her second attempt at the school essay contest. 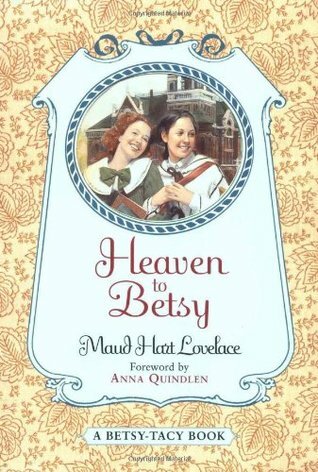 Even more than Heaven to Betsy, this book brings to life the turn-of-the-20th-century teen experience. What is most interesting are the intricacies of socializing both with long-distance friends and with local boys. Betsy's holiday visit with Tib is so special because they have no immediate way of seeing one another or talking in real time on a regular basis. When they part, they're not sure how long it will be until they see each other again. Living in a world with Facebook and texting makes it especially hard to imagine how hard this would be. It's also interesting that both Betsy and Julia establish very specific limits on their dating relationships. They don't hold hands at all, and even though Julia is about to graduate and of marrying age, she turns down a proposal in order to pursue her opera career. They are excellent role models for young girls when it comes to setting limits - and how refreshing to read a teen novel where romance is not the main focus! My favorite part of the boy-girl interaction in this book, though, is the dance programs! I love that each girl has her own program listing all the dances of the evening, and that the boys just come along and sign themselves up to dance with whomever they like. I was also amused by the various meanings attached to the number of dances requested by any given boy, and what was considered acceptable, and what was considered rude. I can't help but think that this old-fashioned method might have removed a lot of awkwardness from my own high school dance experiences. 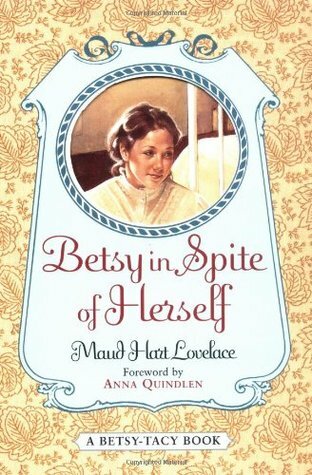 Betsy in Spite of Herself has me completely hooked on these characters. Betsy's future beau, Joe, has started to become more involved in the storyline, and more of his backstory has come to light, so I look forward to seeing where their relationship might lead in the next book, Betsy Was a Junior. In this, the first of the "older" Betsy-Tacy books, great changes are afoot. Betsy has spent a part of her summer visiting family friends away from Deep Valley, and when she returns home, she learns that her house on Hill Street is for sale. The Rays will move to a new house with gas lights, a newly hired housekeeper, and other modern amenities, which will become a gathering place for Betsy's friends in "The Crowd." Tib has moved back to Milwaukee, but Betsy and Tacy remain close friends even as their circle widens to take in other girls - and boys. Also on Betsy's mind is religion as she and her sister Julia determine that they wish to be Episcopalians. Though the appearance of this book, with its sophisticated-looking illustrations, suggests an abrupt change from childhood to adolescence, the transitions feels very natural and gradual in the story. Betsy is understandably overwhelmed by all that is happening in her life and makes a few missteps as her freshman year wears on. Particularly authentic are her concerns over interacting with boys and her disappointment in herself when she lets down her school society by failing to win an essay contest. Also striking about this book is the way the characters speak to one another. With the exception of some slang phrases, Betsy and her friends speak like contemporary teens. In fact, their voices almost don't seem to match up with their physical appearances which involve "waists" and "pompadours." It's fun to think about being fourteen at the turn of the 20th century, and this books make it easy to imagine exactly what it would be like, and to see that some things about being fourteen will never change. Based on this book, I now understand why NPR included Betsy-Tacy on its list of the 100 Best-Ever Teen Novels. While Betsy-Tacy is decidedly not YA, this book is quintessentially YA, and equally reminiscent of Beverly Cleary's First Love series, and the Alice books by Phyllis Reynolds Naylor. The flashing screens of devices like iPads and Smartphones are attractive and mesmerizing to babies, but the American Academy of Pediatrics discourages any screen time before the age of two. Parents who want to keep their babies entertained while they make a phone call, wait in line, ride in the car, or simply take a shower may be tempted to hand over the nearest technological device, but there are actually a lot of really great alternatives. Here are ten simple items that have kept my daughter (7 months old) entertained for 30 minutes or more. Little Miss Muffet is also fascinated by anything made of fabric. She likes washcloths (especially if they have tags), burp cloths, blankets, and our homemade wipes (sewn from scraps of old tee shirts.) I like to give her two cloths at a time so she can hold one in each hand, and she happily chews on them, drops them and picks them up, rubs them on her face, and otherwise cuddles them like loveys. Almost any small piece of fabric works; just be prepared to add it to your laundry pile! Knowing my daughter’s affinity for soft, cuddly things, I picked up a loofah at the dollar store. The fresh, bright color of it (green) combined with the interesting texture make this a very appealing sensory toy. To avoid having your baby get a mouth full of soap or mildew, it’s probably wise to buy this fresh rather than to share one that has been used, but it’s a dollar well spent. Chances are, your child has an abundance of stuffed animals sent by friends and relatives in celebration of her birth, and perhaps even a favorite among them. Miss Muffet is fond of faces, so we often hand her a stuffed monkey or stuffed monster, both of which have smiling faces that she likes to bite, lick, and press on. Now that she has begun scooting, she often drags one of these friends around the living room floor as she checks out her other toys. We take board books with us everywhere because they are portable and I never know when I might have a spare moment to read aloud. Our current favorite traveling companion is First 100 Animals by Roger Priddy, which features colorful boxes on every page filled with photos of animals from different habitats. We often have outdoor reading time, where I will read a chapter from my current read, and Miss Muffet will happily chew on the corners of her book in the shade of her stroller. Occasionally, she drops her book on the ground and fusses for me to pick it up, but I usually make it through a chapter before that happens. Miss Muffet is not crazy about teething rings, but boy will she bite down on some Tupperware! Though I will sometimes put something in her container for her to dump out, often it is just empty, and she bites the rim, rolls it across the floor, bangs it on the baby gate and shakes it in the air. The container we are using right now came from a Chinese restaurant when we ordered soup. She also really likes ricotta cheese containers. When my daughter was born, we were given two sets of Linkadoos. 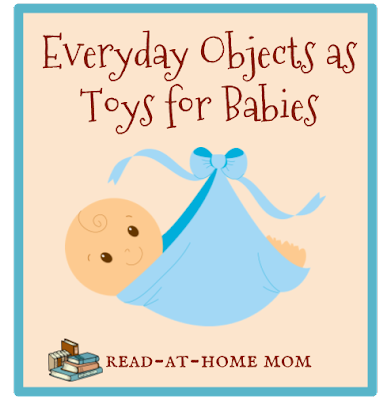 While their ostensible purpose is to attach other toys to strollers, car seats, and high chairs, we have always treated them as toys unto themselves. They come in a variety of textures and colors, and Miss Muffet likes to play with them individually and in chains. Her favorite thing to do is put them in her mouth, but she also shakes a string of them to hear them clack together, and occasionally flings them over her shoulder. In the same dollar store trip where I bought the loofah, I also purchased some Mardi Gras beads. Interestingly, these are the only toy Miss Muffet does not put in her mouth, and she never seems to get tired of them. She drags them across the floor like snakes, holds them in her hand and tugs on them gently, and shakes them around. (She also has a set of wooden rosary beads with which she does many similar things.) I don’t recommend stringing beads yourself and handing them over to a baby because you never know if they might become detached and turn into a choking hazard. It’s best to find a strand without loose beads and to monitor your baby while she plays. 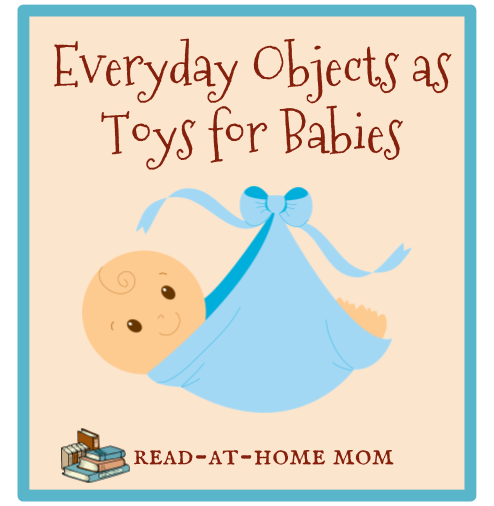 For more ideas for screen-free play for babies, check out this printable handout from screenfree.org. This is the best-written book of all the Anastasia books, which is saying a lot, considering how wonderful the others have been so far. Lowry’s efforts at getting inside the mind of a baby are clever, even if they may not be completely true to life, and Sam generally becomes a more believable character as we witness his development. I loved getting Sam’s take on his sister and parents, and the way Lowry provides logical and thoughtful reasons for his crying, such as the failure of his sister and father to blow on his stomach during diaper changes. Lowry also does a really nice job of seamlessly weaving Sam’s story in with the events the reader remembers from the Anastasia books. I am biased toward liking this book because I’m a new mom of a baby (now 7 months), and I have to admit that I’m not sure how it would be received by kids. There are lots of chapter books and middle grade novels addressing the birth of new siblings - and Sam’s birth is already addressed from a middle grade point of view in an earlier Anastasia book. I’m not sure a book from the baby’s point of view is something kids in late elementary school are really interested in. I’m sure the connection to the Anastasia series is what keeps it on so many library shelves, and maybe what brings some readers to borrow it, but otherwise, I imagine it’s a hard sell. I would, however, add it to the list of chapter books that can be read aloud to preschoolers, along with Ramona the Pest, and the Nora books by Johanna Hurwitz.